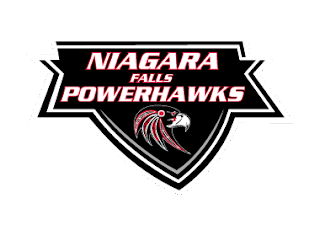 It took a shootout to determine the winner in the Niagara Falls PowerHawks game against the Skylands Kings at the Hyde Park Ice Pavilion Saturday night. While the Kings skated away with a 4-3 victory, the point gained by the PowerHawks clinched them a playoff berth. Another point will cement their hold on second place in the Northeast Division. A quick breakdown on defense during a power play lead to a shorthanded goal by Craig Garrigan to give the Kings a lead at 8:56 of the first period. Skylands would hold that tenuous 1-0 lead through the rest of the first period and through most of the second period. The magical Minichiello brothers added to their season totals when Stephen put one past Mathias Yttereng at 18:19 in the second. Matthew Minichiello and Andrew Logar provided the assists. Eric Vanderhoff responded for the Kings to regain the lead. The unassisted tally came with only 30 seconds left in the period. The back and forth battle continued in the third period. Niagara Falls tied the game off the stick of Michael Olszewski at 3:37. Matt Cavanaugh and Frankie Bodami assisted. Skylands took the lead back when Stephan Sizov scored on the power play at 11:25. Dylan Dinzik and Craig Garrigan assisted. Niagara Falls tied the game with under four minutes to play in regulation. The Minichiello brothers made it 3-3 at 16:03 as Matthew fed the puck to his brother, Stephen, who put it behind Yttereng. After an overtime period that saw penalties to both teams and no scoring, the teams faced a shootout to determine the winner of the contest. Eric Vanderhoff scored the only goal from any of the six shooters to give Skylands the win. The same teams will face off again Sunday afternoon with a 1:00 start at the Hyde Park Ice Pavilion.